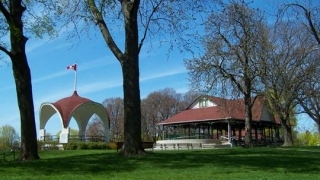 Montebello Park is the main park in the Downtown St. Catharines. The park is located along Ontario Street at the south end of Lake Street in St. Patrick’s Ward It was designed in 1887, by Frederick Law Olmstead, the founding father of landscape architecture in the United States, and one of the designers of Central Park in New York City. This park is the home of numerous events and festivals throughout the year. Visitors to the park will enjoy the playground and open space, viewing the 1,300 rose bushes or listening to concerts throughout the summer months. The pavilion and band shell are available to rent for special occasions. Band shell plays host to free concerts every Sunday and Tuesday 7-9 pm, June to September. This park has washroom facilities and is surrounded by metered parking. This park is 2.49 hectares. Planning a get-together or searching for a location for wedding photos? Permits are available for this park for those purposes.